When, in January 2009, we just had arranged our apartment in Moscow, and most of my belongings were still in Belgium, Irina had given me a few t-shirts. For I had nothing else to wear those days. 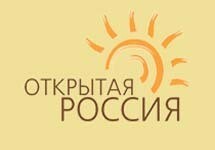 It were light gray t-shirts with, left on the chest, a playful orange sun and, in blue letters: Открытая Россия - Otkrytaya Rossiya [Open Russia]. I liked that idea. “But you shouldn’t wear it in the streets,” Irina said, “you could get in trouble”. Of course, with my slightly rebellious spirit, I went on the street with it. But to my great disappointment no one responded. Nobody looked at me angrily. Nobody laughed at me. Nobody asked questions. No policeman stopped me. 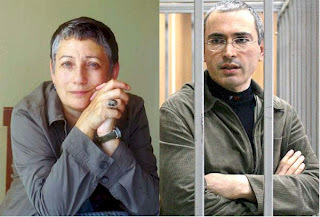 The Muscovites did not really seem to care about the fate of Mikhail Borisovich Khodorkovsky. But things can change. Since that time, tens of thousands of Muscovites already expressed their discontent. Spontaneously, without being paid for it. Open Russia was a nation-wide civil organization, founded by Mikhail Khodorkovsky, a citizen of the Russian Federation, CEO and co-owner of Yukos, once Russia's largest oil company. And he was in prison. Officially it was for tax evasion, but in fact because, with Open Russia, he often criticized Vladimir Putin's regime, and gave financial support to various Russian Liberal Democrat parties. In 2008-2009, the Russian writer Lyudmila Ulitskaya had an intense correspondence with Mikhail Khodorkovsky. It was published in Novaya Gazeta. On January 13, 2009, this correspondence was awarded with the Literature Prize of Znamya Magazine. On this blog, you can read the entire correspondence in English, Dutch and French with annotations and footnotes. I've been uptight and made a mess. But I'll clean it up myself, I guess. Oh, the sweet smell of success. Handle me with care. Jan F. Shibalov 2010. Watermark theme. Powered by Blogger.